This year’s CPD awards took place in Burlington House on the 30th October. 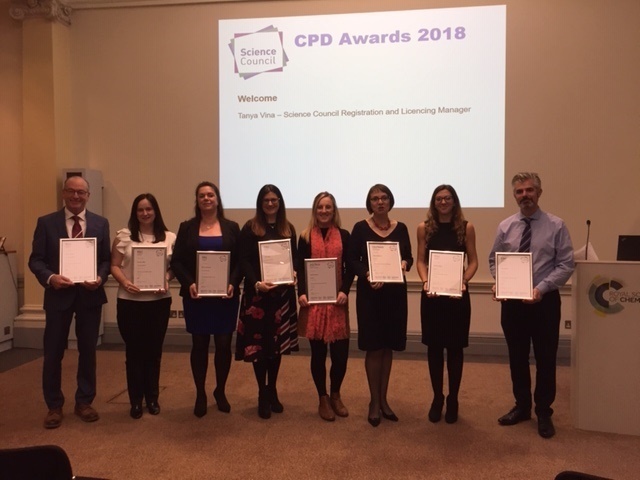 The annual CPD Awards is designed to celebrate the continuing professional development (CPD) efforts and achievements of registrants from across the registers: Registered Science Technician (RSciTech), Registered Scientist (RSci), Chartered Scientist (CSci) and Chartered Science Teacher (CSciTeach). Now in its fourth year, the awards offer them recognition for their broad and diverse range of professional activities. As we look forward to the CPD Awards 2019 next year, registrants who are interested in submitting a nomination are advised to start working on evidence for their CPD record right away – ensuring that reflection against activities is well demonstrated – to be able to submit the best possible nomination.